Realtors are not the problem with affordability as most people would like to believe. Most of us have concerns about rising housing prices and we are fully aware that the reality of owning a home is becoming increasingly distant and out of reach for the average consumer . Most of us actually care very strongly for our clients. Realtors believe that increasing the number of homes built along transit corridors, raising the property transfer tax threshold and incentivizing faster approval processes are all necessary to improve housing affordability across the province, according to the British Columbia Real Estate Association’s housing affordability plan released April 19. 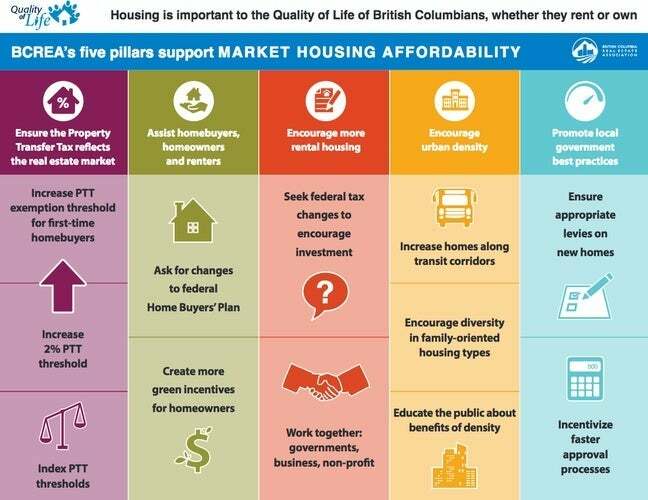 Here's how the BCREA wants to address housing affordability.